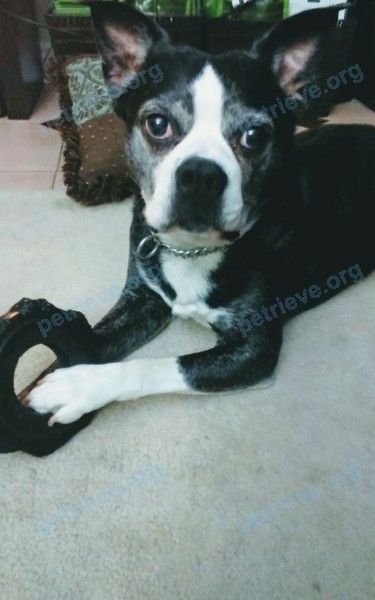 Dexter is a boston terrier mix ,so he is slightly larher than a pure bread boston, DEXTER has one white paw with alittle white runnjng down his face, he is wearing a chain with a skull bone with his name and number. Unfortunetly the number is recently out of service. He wondered out of the yard without his breakfast or sweater, he may be hungry and cold . Please help him find his way. He is usually very friendly with ppl but nervous/aggressive towards some other dogs - more so large dogs.